Discoverit is no more! But hold your tears, it has been reborn as Repost Repository! I know, I know, what a name. It came to me in a dream–or more accurately, as I was sitting around this afternoon. I mean, it is all just reposts from Reddit anyway–basically my private funny gif and meme gallery. 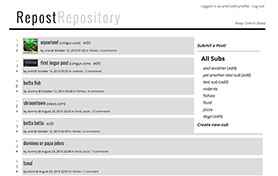 Repost Repository (or Repo2 for short) has been reskinned to suit its new name as well, in greyscale and sans-serif vs the somewhat formal teal and serif theme before. Fonts used were Oswald and Open Sans–yes, that old stand-by–from Google Fonts. (Check out their new redesigned site!) I also threw in some basic small-screen/mobile considerations: move the side-column to the top, shrink the header, expand widths to 100%, etc etc. And it all plays nicely with the palette-swapping feature I added, which I still find fun to spam. Next up for Discov-I mean, Repost Repository will be some smart-detection features like recognizing giphy/gfycat/youtube urls as well as imgur ones. Content enhancement stuff. The site doesn’t really need much; its purpose is pretty straightforward. Just read the name, right?